Ray Dumont, a native of Lewiston and the next Food For Thought presenter, will discuss how he discovered live theater and the adventures he has had along the way to a career in the arts. LEWISTON — Raymond Marc Dumont, a native of Lewiston and the next Food For Thought speaker, will discuss how he discovered live theater and the adventures he has had along the way to a career in the arts. He plans to talk about how the industry has changed and his history with the Maine State Music Theatre intern program. 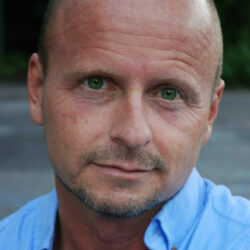 Dumont, a longtime member of Actors Equity, has worked throughout New England and in national regional theater. He has a long-term relationship with MSMT where he has worn many hats, beginning as an intern in 1993 and moving through various posts until he became managing director in 1999-2003. “I need to theater all the time. It is my passion,” he said. Last season MSMT closed its season with a performance of “Pinocchio,” directed and choreographed by Dumont and produced and performed by MSMT’s Educational Fellows. Dumont will address the USM L-A Senior College Food For Thought luncheon at noon Friday, April 12. The program is free and open to the public. Luncheons take place in room 170 at USM-LAC, 51 Westminster St. Cost is $8 for lunch, and an advance reservation is required. To reserve, call 207-753-6510 before noon Wednesday, April 10. Food may also be purchased at the campus cafe.